If you had ever wondered where you could get an ideal hosting solution that was made specifically for WordPress sites, then WP Engine is your answer. The company hosts on the WordPress domain itself. WP Engine is proud to show that it is the company of choice for the likes of AMD, Four Square and HTC and the credibility of these companies only adds girth to the reliability of WP Engine as a hosting platform. At best, it helps you feel rest assured that you could become a satisfied customer, too. Anyone that has used WordPress knows that it is, at present, one of the easiest blogging applications to use. For newcomers, rest assured that your blogging experience doesn’t get any better than when you blog with WordPress. Combine that fact with a hosting solution that makes it even easier to work with and you have a winning combination. WP Engine makes it all simple, even when you have zero experience working on blogs or websites. If you have any doubts or apprehensions about how a new app is going to work on your new site, you can simply install it on the staging area that WP Engine provides for you. You can try out new themes, install plug-ins, delete the duplicate site and recreate it from the ground up – you can do anything. WP Engine comes with a boatload of features that will make your WordPress blogging experience an extremely pleasant one. For bloggers, WP Engine makes sure that you don’t have to worry about bandwidth caps by letting you have unlimited leeway. You also want your clients to be able to access your posts as quickly as possible. If you were to have all of them on one server, you’d probably have all of them fighting over one page. Therefore, WP Engine makes sure that all your traffic is balanced by hosting your site on whichever server is closest to your visitors. This helps ready you in a major way. When hosting with WP Engine, you will have the ability to host videos, images and chat engines – pretty much any sort of media. Support at WP Engine is done by a staff that is 100% dedicated to WordPress. When you have a focused group resolving issues, you can rest assured that quick resolution of issues are forthcoming. 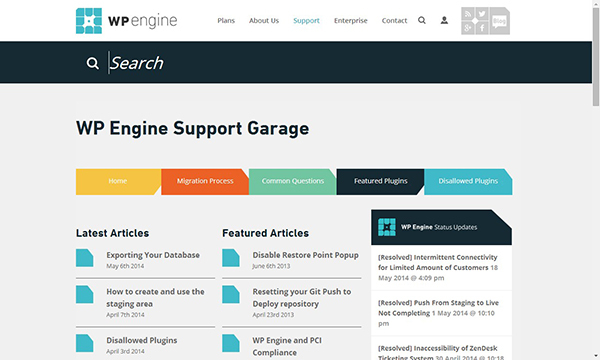 But just in case you’re the type who likes to get under the hood, you can go to the WP Engine Support Garage and have a look at the documents that have been uploaded for your convenience. The manuals have been grouped according to problems and also parts of your webhosting processes. There’s a group that helps you address all migration issues, for example, and another one that tells you all about plug-ins that have been disallowed. WP Engine even has a plug-in on the page that shows the most recent issue that has been tackled and resolved. You can check to see if any of them help you. If not, you can call them or email them for 24/7 non-stop support. EP Engine has four plans for its clients to choose from. First, there is the Personal hosting plan. 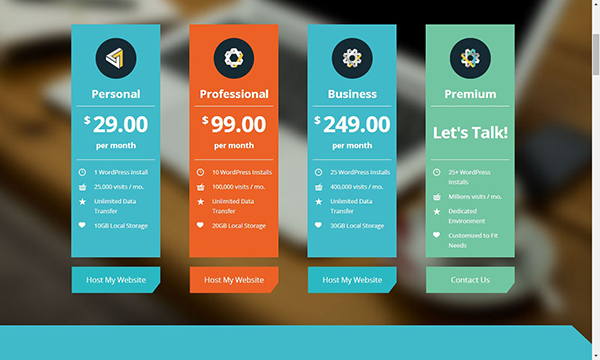 The price is $29 per month and comes with 1 instance (installation) of WordPress, has a cap of 25,000 visitors per month, unlimited data transfer bandwidth and 10 GB of disk space. The second hosting plan, named Professional, costs $99 per month, allows for 10 instances of WordPress, has a cap of 100,000 visitors per month, and offers unlimited data transfer bandwidth with 20 GB of disk space. Third, is the Business hosting plan. The cost is $249 per month and allows for 25 installations of WordPress, allows for 400,000 visitors per month, unlimited data transfer and 30 GB of disk space. Finally, there is the Premium hosting plan. In this case, more than 25 WordPress installations are allowed, millions of visits per month are allowed, the environment is dedicated and any customization can be done to meet your specific demands. But, you will have to contact WP Engines so that you can agree on a price. Should you, by any chance, exceed your bandwidth, you needn’t worry that WP Engine might simply delete your site or disable your account. All that will happen is that you will be charged an extra $1 for every 1000 visitors that are above your limit.